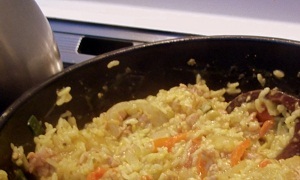 If you haven’t prepared Paella before, then you need to read this post. Paella is the ultimate hostel dish; its cheap, can be made with all kinds of fresh ingredients, easy to share, and keeps well for leftovers! Get away from the pasta routine and try some new flavors. Share the meal with friends, or make new ones over a meal. Below I’ve listed some of the main ingredients found in Paella, but don’t let this ingredient list confine your imagination. In a nutshell for 3 servings you need paella spices (many places you can get saffron rice otherwise saffron or turmeric), 1 part rice, 2 parts liquid (water, chicken or beef brother, wine, beer) vegetables, and some protein (beef, pork, chicken, beans, squid, shrimp, scallops, mussels). Done. Let me know your thoughts! 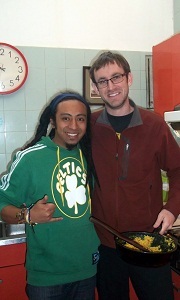 Share some stories about your Paella experience, send some photos in I’ll post them! But most of all enjoy yourself on the road. Like we said at the top of the post once you have made a paella or two you can get creative and add any mix of vegetables or meats to your liking. Our favorite vegetables have been red peppers, peas, and artichokes. We also have had great success with shrimp and calamari. When added shrimp and calamari, I recommend adding them 5 minutes into step #7 when you have 10 minutes of simmering left. This will allow the seafood to cook without over cooking.